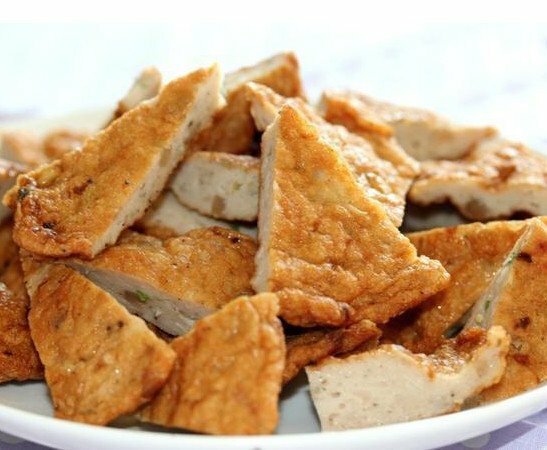 Hanoian and Northern Vietnamese cuisine is influenced by China, which explains the abundance of stir-fries, egg rolls, soya sauce and food additive MSG. Dishes are more stringent in the use of herbs and spices. 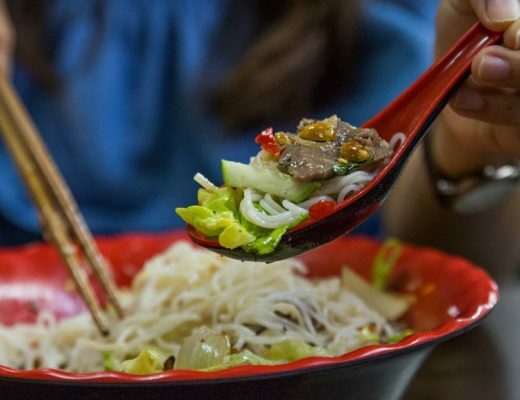 Bun Cha: Hanoi’s favourite lunch food, this noodle dish includes ground pork patties and vermicelli noodles in a sweet broth made with pickled veggies, vinegar and fish sauce. 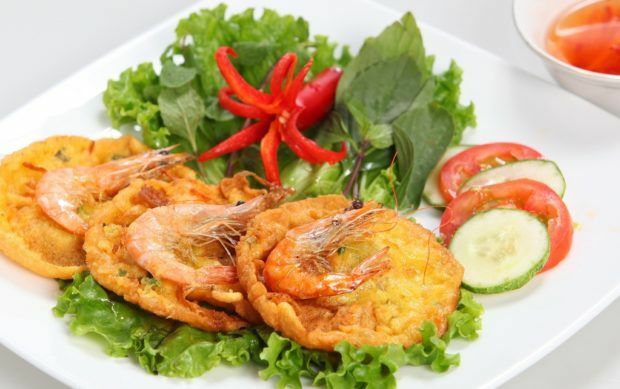 Banh Tom: So good it should be a donut, this crunchy shrimp cake consists of deep fried prawns in batter with slices of sweet potato lovingly laid out on a bed of lettuce and herbs. Pho: Vietnam’s most famous export, this rice noodle soup has different versions throughout the country. 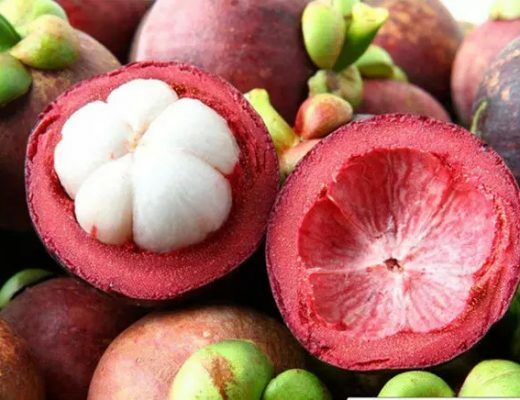 It can be served with chicken or beef, and is usually accompanied by fresh herbs. Add a squeeze of lemon juice for a little bit of tang. Cha Ca: Thin slices of this grilled fresh water fish are mixed with ginger, saffron, cold vermicelli noodles, pepper and fish sauce, then placed on bamboo skewers and grilled on a burning charcoal stove on the dining table. 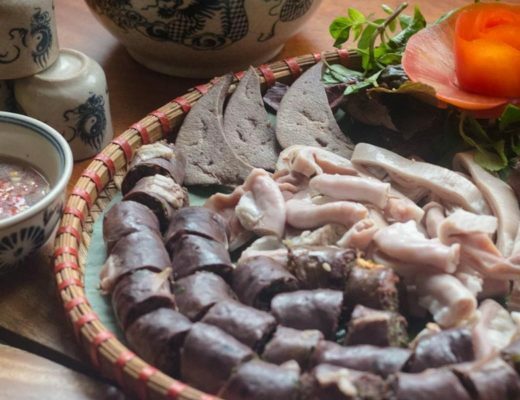 Banh Cuon: A paper-thin rice pancake rolled with ground pork and wood ear mushrooms and accompanied by a dipping sauce filled with herbs and sausages. When you need to fill up in the capital city, you don’t need to look far to find great food. A lot more understated. That’s how northern Vietnamese food measures up to its southern cousin. There is less sugar and a whole lot fewer chillies in northern Vietnamese fare. Because of the north’s cooler climate, herbs and spices are not used as frequently as in the cookery of southern Vietnam. Seafood, especially crab, figures prominently in northern Vietnamese cooking. When in Hanoi, try a full range of noodle soups native to the north including Bun Thanh, Bun Rieu, Bun Bung and Bun Vit Sao Mang.